Katie travels throughout the world teaching and lecturing. Katie’s easy, energetic manner has made her a very popular teacher and lecturer. 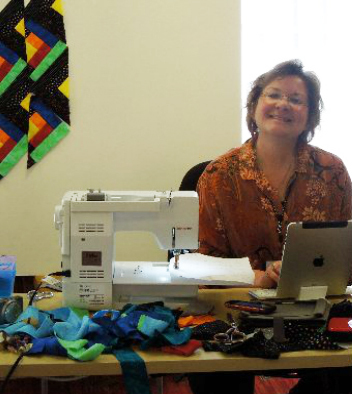 When not in residence at her studio in Fortuna, CA she travels the world presenting her contemporary quilting theories and techniques to classes; not only in North America, but in Europe, the Far East, Australia and New Zealand. Please contact Katie for Workshop and Lecture pricing. View the listing of Online Classes. The cost of the Online Courses are $175.00 and $200.00. Join Katie and 10 others in one of the new dynamic online classes with personal critiques and feedback to spark and enrich your creativity.